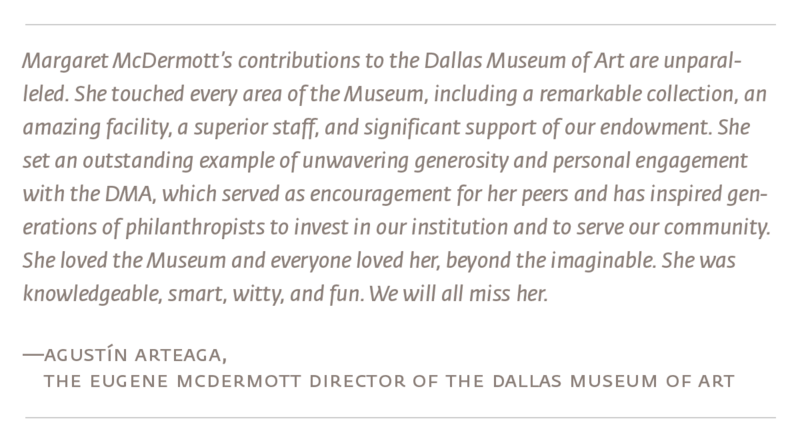 Margaret McDermott was a visionary patron of the arts, education, and healthcare whose generosity of spirit has had an immeasurable impact on the cultural and social fabric of the Dallas community for more than six decades. 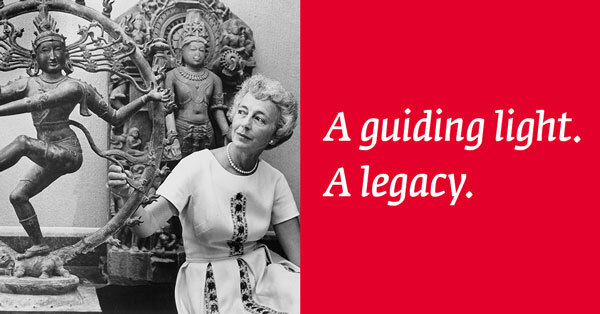 She was the single largest benefactor in the Museum’s history through her legendary gifts of art and endowment support. Her philanthropic leadership and unflagging commitment to the arts transformed the Dallas Museum of Art from a regional museum into an institution of global stature. Mrs. McDermott’s goal was to build the Museum’s collection for future generations, and her unparalleled support of the DMA included the donation of over 3,100 works of art spanning different cultures, disciplines, and eras. Mrs. McDermott’s legacy of generosity and grace, as well as her strength of conviction, will serve as an unprecedented model for public service and arts philanthropy for generations to come. The DMA will celebrate her life at a private memorial event. In the coming weeks, the Museum will open a public exhibition of masterworks of Impressionist and modern art from the private collection she built with her husband, Eugene. These works, which were generously bequeathed to the DMA by Mrs. McDermott, highlight her love and support for the arts and the Museum that she helped establish as a leader in the art field. A trustee of the Museum for 57 years, Mrs. McDermott championed remarkable institutional change at the Museum, and was considered by many to be the Museum’s “guiding light.” In addition to her development of the Museum’s collection, through individual gifts and through the creation of the Eugene and Margaret McDermott Art Fund in 1960 to support the Museum’s active and ongoing program of acquisitions, her support of the DMA encompassed major capital and endowment gifts, including the endowment of the directorship and eight named curatorial and staff positions, funding for educational programs, and support for Museum operations and exhibition development. In addition, Mrs. McDermott regularly made leadership gifts to the Museum’s capital campaigns, including the Campaign for a New Century, launched in conjunction with the DMA’s centennial in 2003–04; new curatorial and educational programs; and capital improvements. She also generously supported the Museum’s internship program, helping college and graduate students foster new careers in the arts. Mrs. McDermott was married for 19 years to Eugene McDermott, a co-founder of Texas Instruments, a strong philanthropist of the arts and education, and a former Board member of the Museum, who passed away in 1973. The couple’s daughter, Mary McDermott Cook, serves on the DMA’s Board of Trustees and is President of the Eugene and Margaret McDermott Art Fund. Mrs. McDermott’s formal association with the Museum began in 1949, when she joined the public relations staff at the Dallas Museum of Fine Arts (DMFA), which, later, under her leadership as a trustee, would become the Dallas Museum of Art. As president of the DMFA during the 1960s, Mrs. McDermott championed the idea for and contributed support to the presentation of the ambitious and nationally acclaimed 1962 exhibition The Arts of Man. This expansive overview of 877 works from around the world laid the foundation for the institution’s cross-cultural presentations and programming. 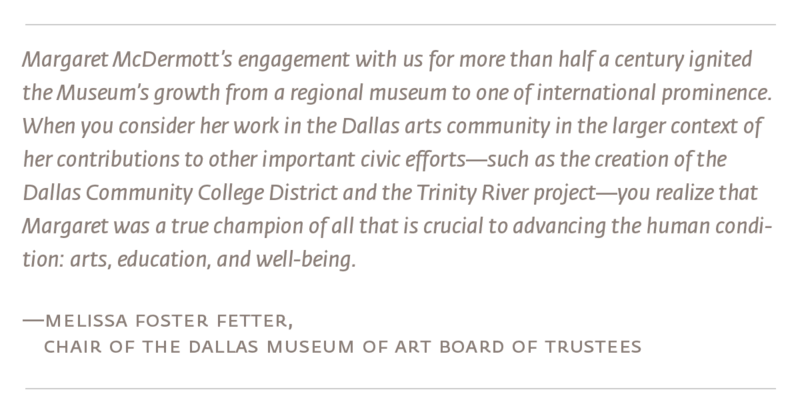 The following year, she led the Museum in the merger of the DMFA with the Dallas Museum for Contemporary Arts, marking the beginning of the Museum’s serious development of a contemporary art collection. As a trustee, Mrs. McDermott worked with the DMA leadership to grow, shape, and deepen the Museum’s collection—in particular its holdings of non-Western art, European painting and sculpture, and decorative arts. Her gifts were often made quietly and without fanfare, designed to address specific needs in the Museum’s collection. The first work she, together with her husband, donated to the Museum was Flora, a sculpture by Aristide Maillol in 1960. The following year, they gave van Gogh’s River Bank in Springtime (1887). Additional highlights of the many significant works of art that she donated to or acquired for the DMA include two important works of African art from the Asante peoples of Ghana dating from the first part of the 20th century; two masterworks of Asian sculpture, Shiva Nataraja from 11th-century India and a pair of Chinese ceramic lokapalas (c. early 8th century); Juan Gris’s Guitar and Pipe(1913); Piet Mondrian’s Windmill (c. 1917); John Singleton Copley’s pair of pendant portraits of Woodbury Langdon and his wife, Sarah (1767); David Smith’s Cubi XVII(1963); a Peruvian Paracas mantle (c. 300–100 BC); and a Mexican mask of jadeite from the Gulf Coast Olmec culture (c. 900–500 BC). Through the Eugene and Margaret McDermott Art Fund, the objects that have entered the collection are of the highest quality and significance. They also reflect Mrs. McDermott’s extraordinarily refined eye as she worked with the Museum’s curators to build its encyclopedic collection with masterworks. For example, through the generosity of the McDermott Art Fund, the Museum acquired its first oil paintings by such important and impactful 19th- and 20th-century European masters as Henri Matisse, Georges Braque, Yves Tanguy, Eugène Delacroix, Gustave Caillebotte, Ernst Ludwig Kirchner, and Paul Signac. These staggering acquisitions transformed the Museum’s European collection, allowing it to explore the trajectory from Impressionism to early Modernism more fully in the galleries through truly spectacular examples of painting. Recent acquisitions through the Eugene and Margaret McDermott Art Fund have included a solid silver vitrine made by the Wiener Werkstätte (Vienna Workshops) in 1908, originally owned by the Wittgenstein family of Vienna and considered a triumph of early 20th-century design; two outstanding works of African art, including the greatly admired and sought after Songye four-horn community power figure and a rare quality Ejagham headcrest; and Marsden Hartley’s Mountains, No. 19. Mrs. McDermott’s constant presence, dedication, and leadership at the DMA also inspired countless others to support the Museum through collection gifts and financial support. Notable among these were the gifts in the 1970s of the Wise Collection of Ancient American Art, the Schindler Collection of African Sculpture, and the Stillman Collection of Congo Sculpture—three collections that gave the Museum added significance and stature among scholars and patrons, and that set the stage for the DMA’s move to the then nascent Arts District. Mrs. McDermott’s dedication to the city of Dallas extended to countless other cultural institutions and organizations, as well as to education, medical research, and community affairs. Among her most visible contributions was a lead gift for the creation of Dallas’s Trinity River bridges, designed by Santiago Calatrava. Mrs. McDermott was also the first major donor to the AT&T Performing Arts Center, served as the founding benefactor of the Dallas Institute for Humanities and Culture, and donated funds for the Eugene McDermott Concert Hall, the principal performance space of the Morton H. Meyerson Symphony Center. The McDermott family has also been tremendous supporters of the University of Texas at Dallas since its inception, with Eugene McDermott serving as a founder of the research center that would later become UT Dallas. Additional contributions to the university made by Mrs. McDermott include the donation of Jim Love’s sculpture Jack in 1976 and the establishment of The Eugene McDermott Scholars Program in 2000 in honor of her husband, for whom the campus library is named.